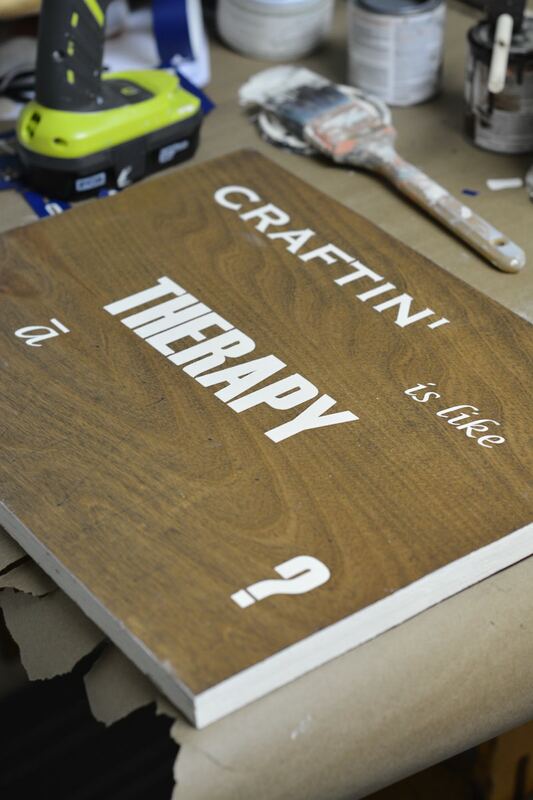 It’s true: Craftin’ is like therapy, ain’t it? 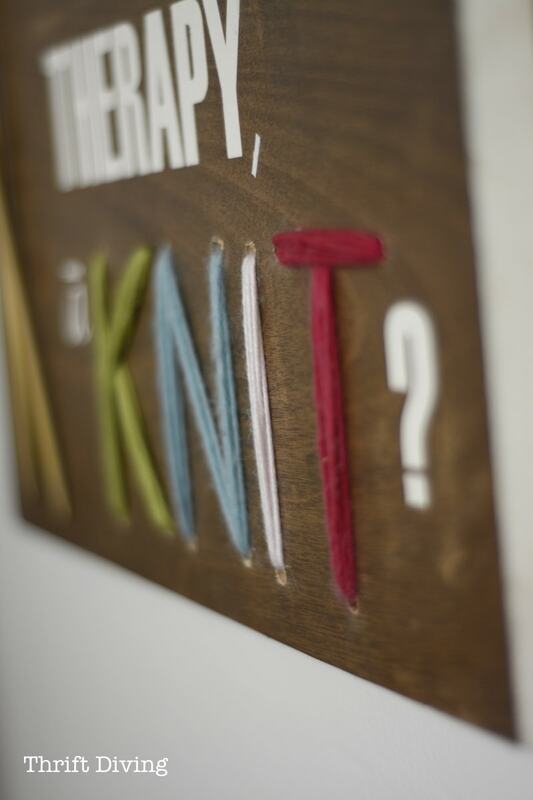 Well, in this case of this fun yarn wall art, it’s more like “a-KNIT?” Get it?? I wanted to create some yarn wood art with a piece of scrap wood and my power drill. I’ve been dying to weave yarn through wood since forever, but I didn’t know what kind of project to do until now. This knitted art is quick and should only take you about 1 hour, tops. 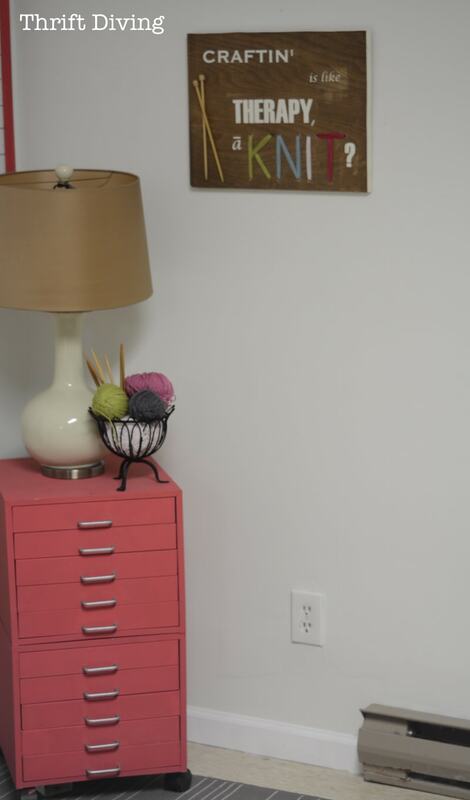 You’ll need a piece of wood, stencils, yarn, a power drill, and tape! ….I mean, we could buy new, but why would we, right?? AFTER! – Yarn and Wood Art! 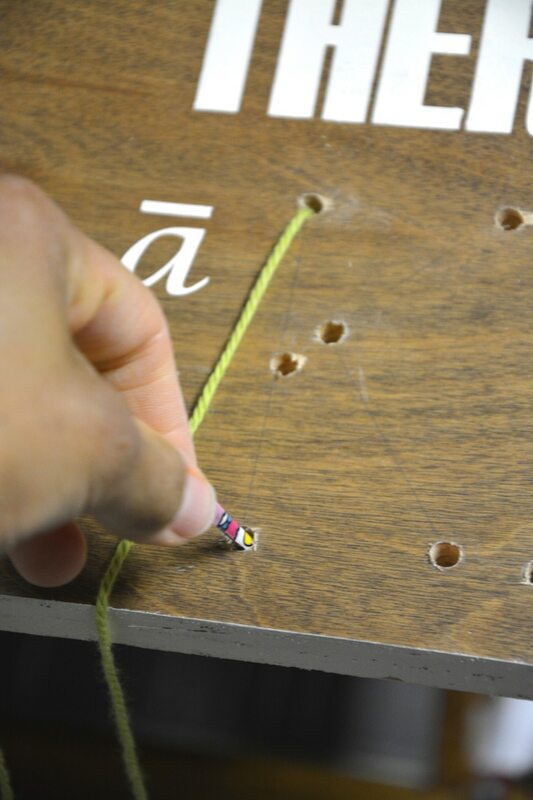 With just holes drilled into a board, I could spell out anything I wanted and use colorful yarn to wrap through the wood holes. 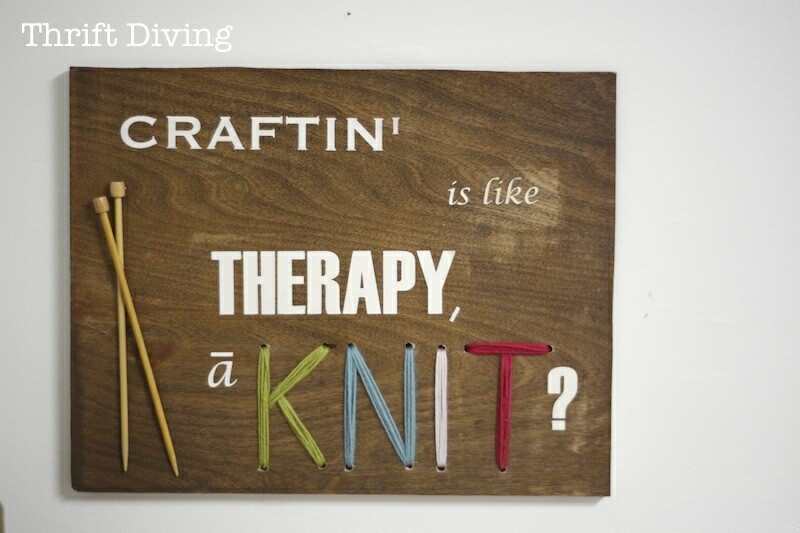 A totally crafin’, knitted art piece that only takes a drill make! 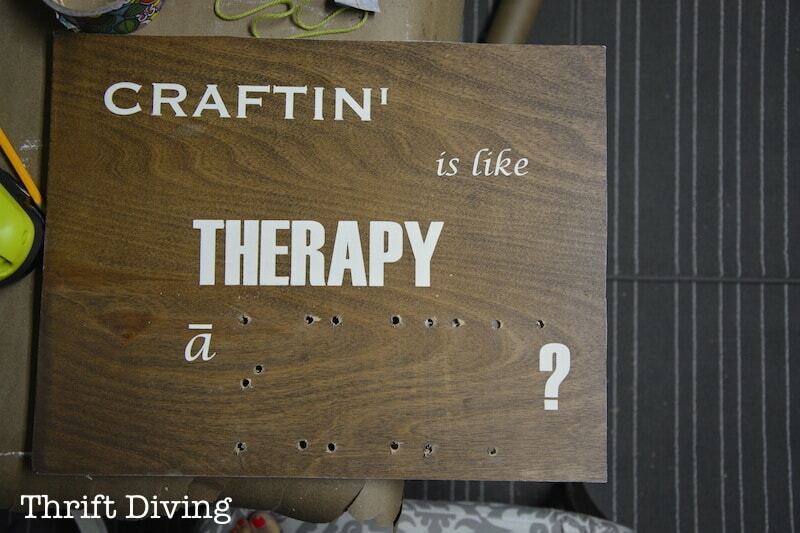 Craftin’ is like THERAPY, ain’t it? Most people may not get it. I know…..sometimes you can be too clever that only yourself gets the joke. LOL. Hopeful you get it! It’s now hanging up in my colorful basement office recently. (I participant in the Amazon Services LLC Associates Program and other affiliate advertising programs designed to provide a means for me to earn fees by linking to Amazon.com and affiliated sites). Stencil (I used my Silhouette Cameo, but you can use any letter stencils you want). 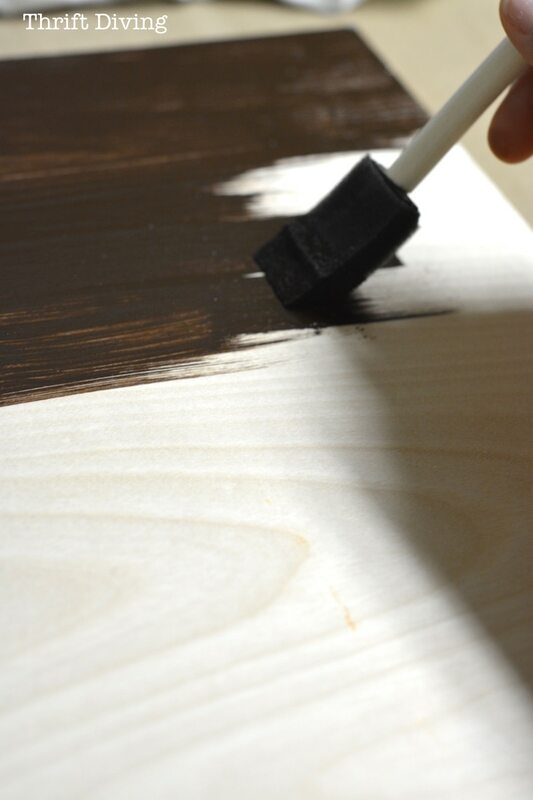 STEP 1: Paint or stain your wood. 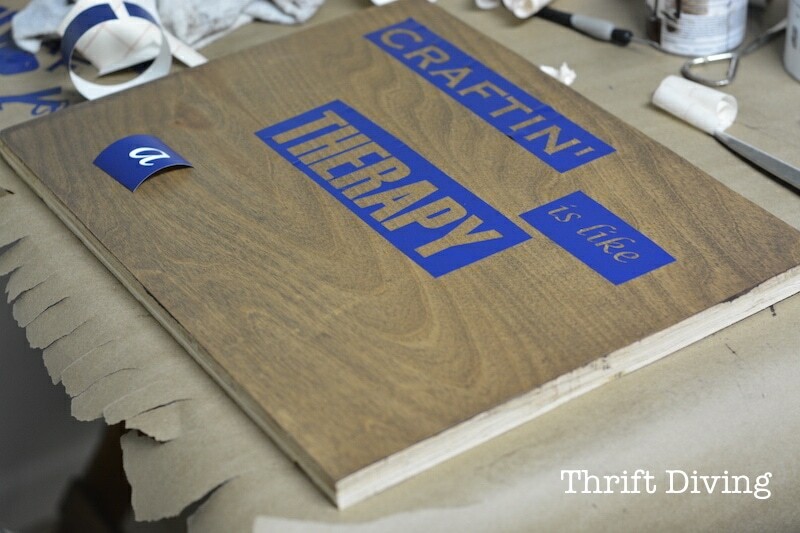 You can also use an old piece of wood that you already have lying around, like an old cabinet door or something! Wipe off the old stain with a cloth. Feel free to paint the board. Either way is fine. 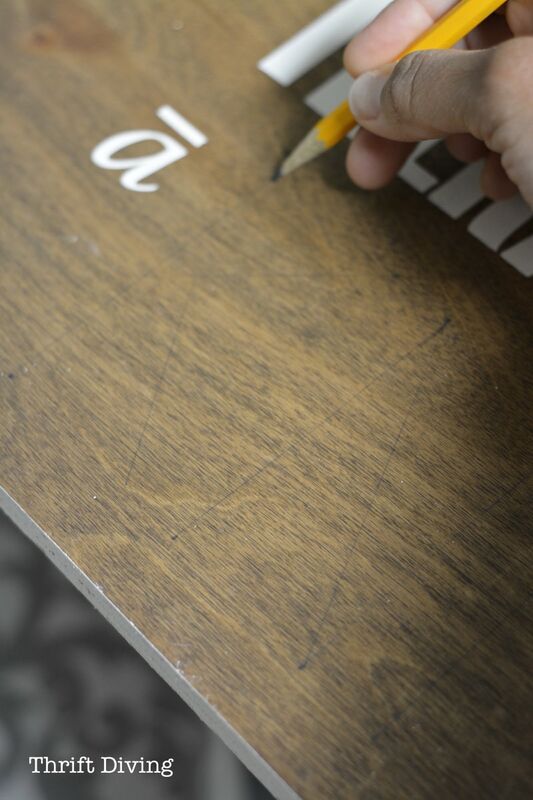 STEP 2: Add your stencil to the wall art and paint it. 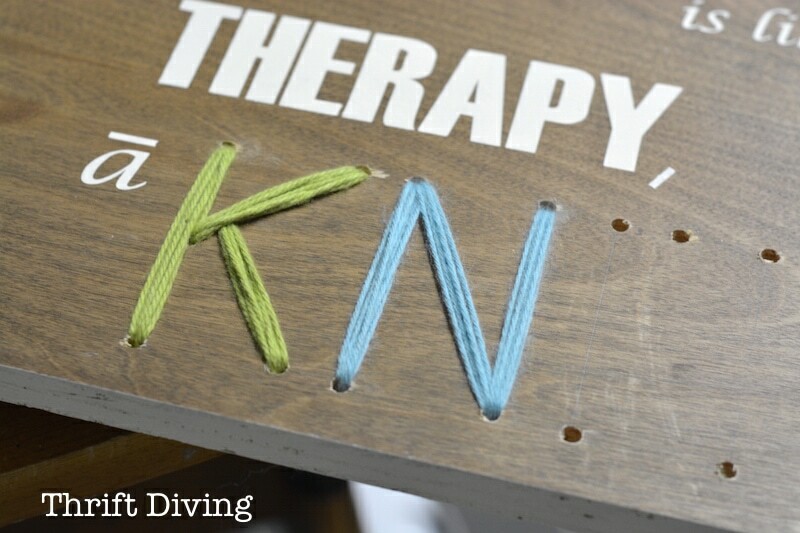 Might be a little hard to see against the dark stain, but I wrote the word “KNIT.” And then at each point of the letter, I draw little dots to show me where to drill into the wood. STEP 4: Drill at the points. 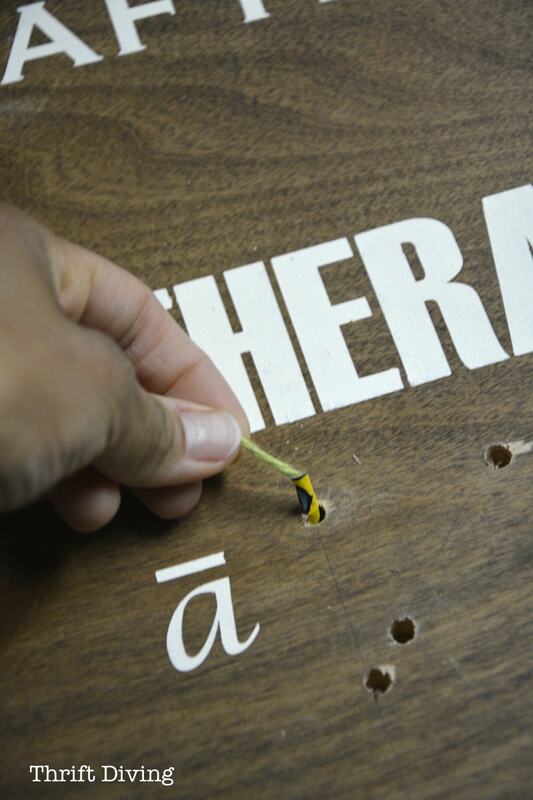 I started drilling at the “T” as you can see here. 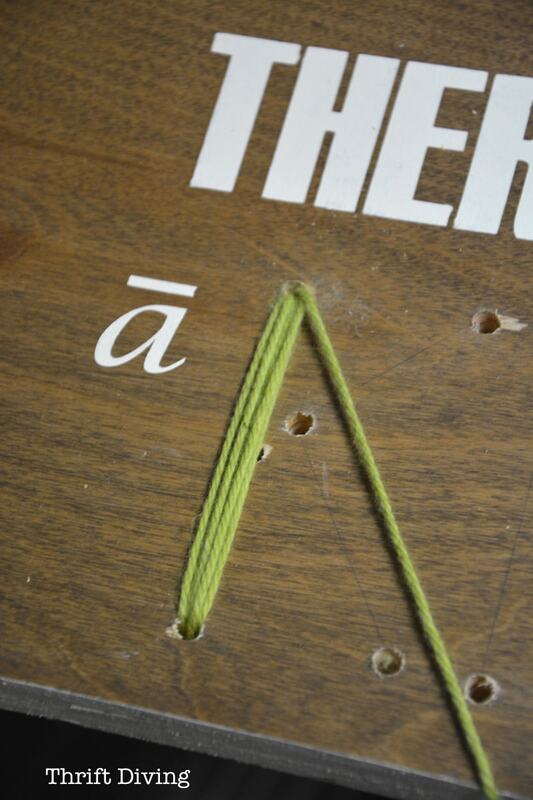 This is where you’ll weave the yarn into the wood to spell out the letters. TIP: Here’s an excellent tip for drilling clean holes into your wood: be sure to have a scrap piece of wood underneath your wood art. The scrap piece of wood underneath the section you’re drilling helps to prevent something called tear out, which occurs when the drill bit rips out the splinters of wood on the backside of a hole. 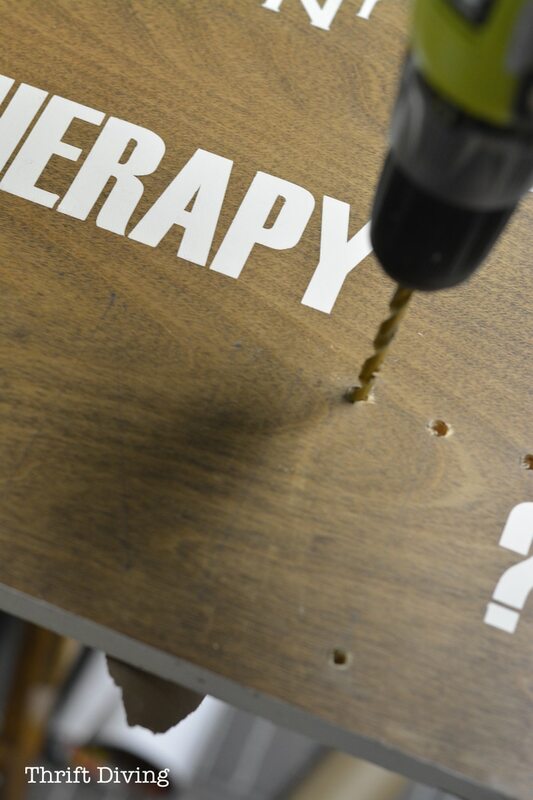 For more info on this, watch this YouTube video where I explain in detail how to prevent tear-out when drilling while working on my DIY word light sign. 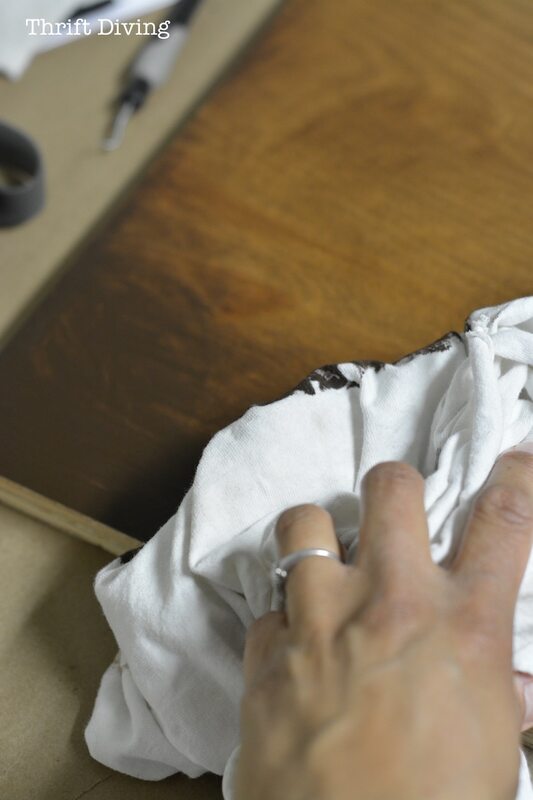 TIP: If you know exactly where you want your holes, I recommend drilling them before staining and stenciling. That way you can sand it down, clean it up nicely before staining. I messed up and did it the opposite way. Oh, and at this point, you probably should apply a polyurethane sealer, which I did not. STEP 5: Tape the ends of the yarn. 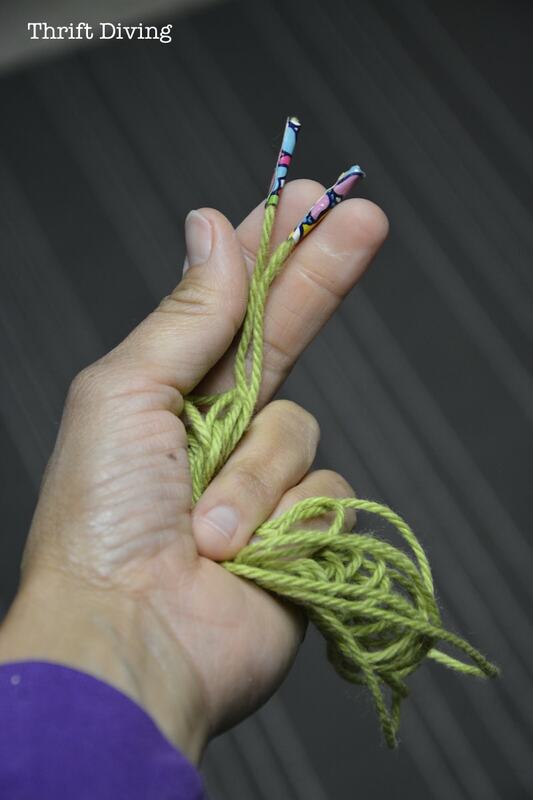 This is how you’re going to weave the yarn through the wood. It’s just like the ends of a shoestring! 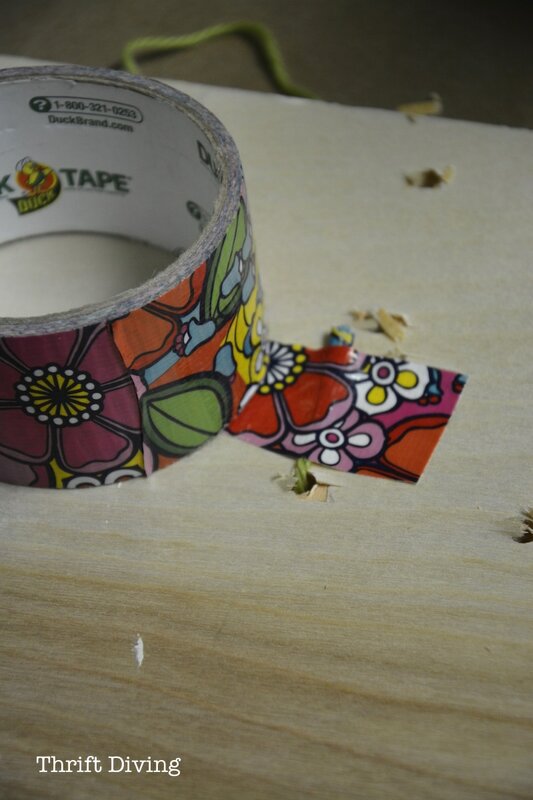 Tape both ends of the large piece that you cut. Cut enough so you have plenty to weave through. Weave the yarn through the first letter. 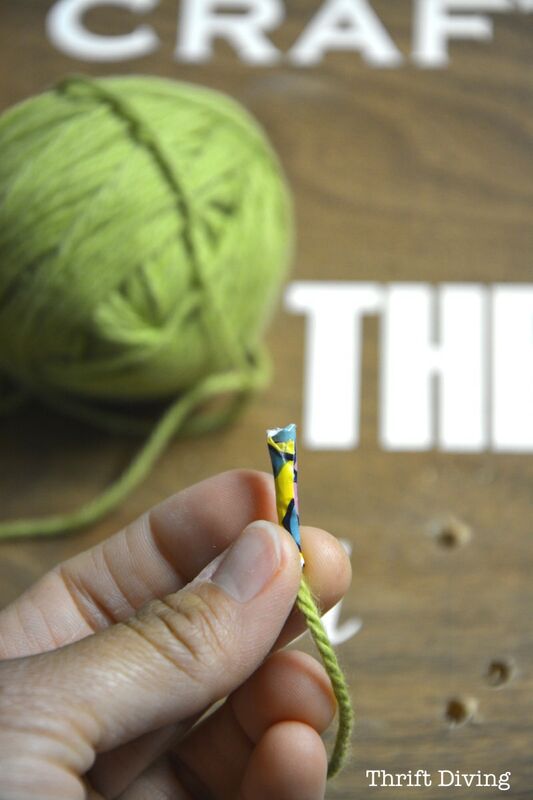 Secure the end of the taped yard to back with more tape so that you can start weaving it through the rest of the wood and the yarn won’t come out. The wall art started to look like this. When you’re done your first letter, it will look like this. 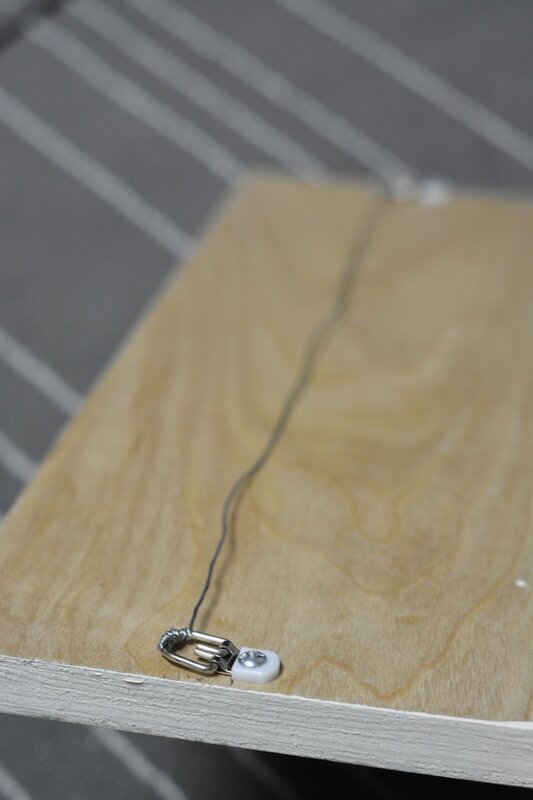 On the back of the wood, you’ll secure the other end of the knitted yard with more tape. 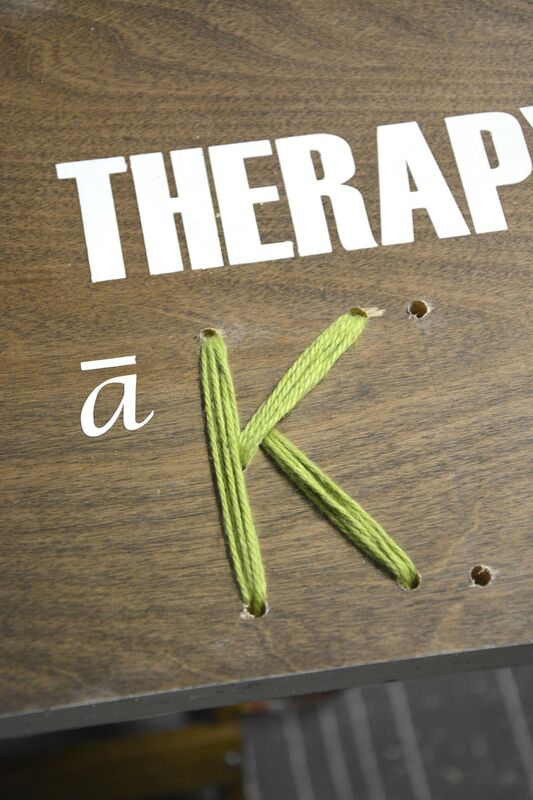 STEP 6: Weave all the letters with different colors of yarn. 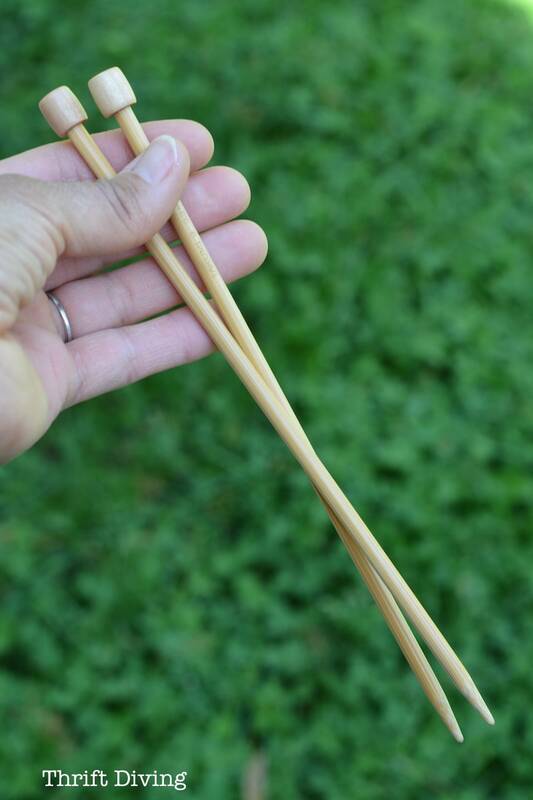 STEP 7: Hot glue some knitting needles. 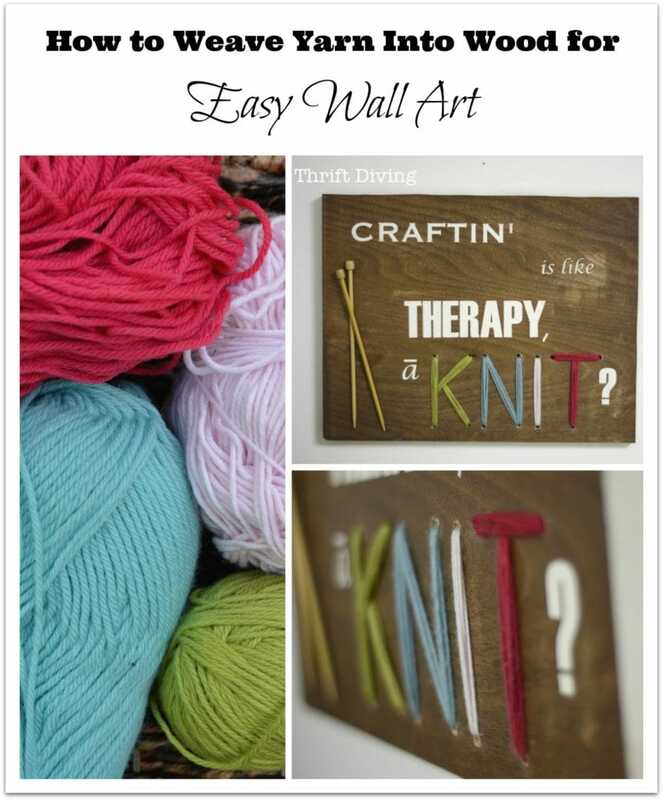 Using some hot glue, secure a couple of extra knitting needles to the wall art. STEP 8: Add D-ring picture hangers. Use your drill to easily add hardware to the back. (FYI, you may need wire cutters if you’re using wire and it’s too long). STEP 9: Hang it on your wall! I’ve got the yarn and wood wall art hanging in my office, but you can hang this anywhere in your home! 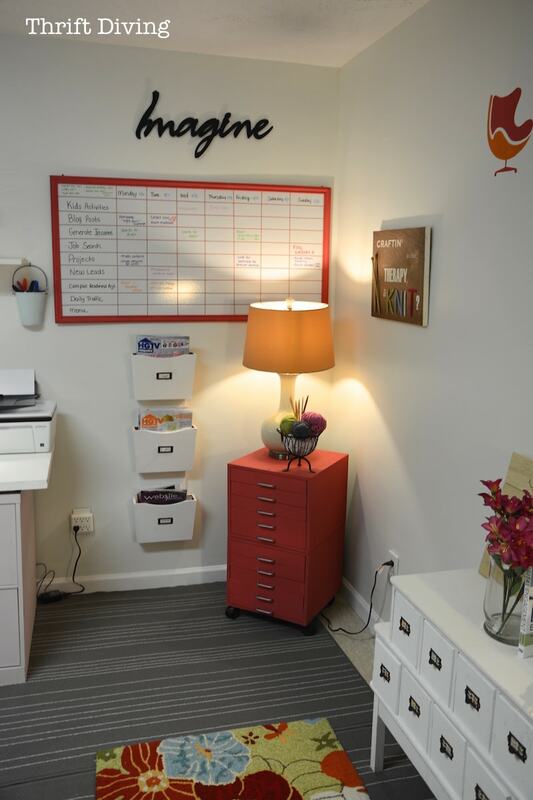 A crafting room or office is best, though. 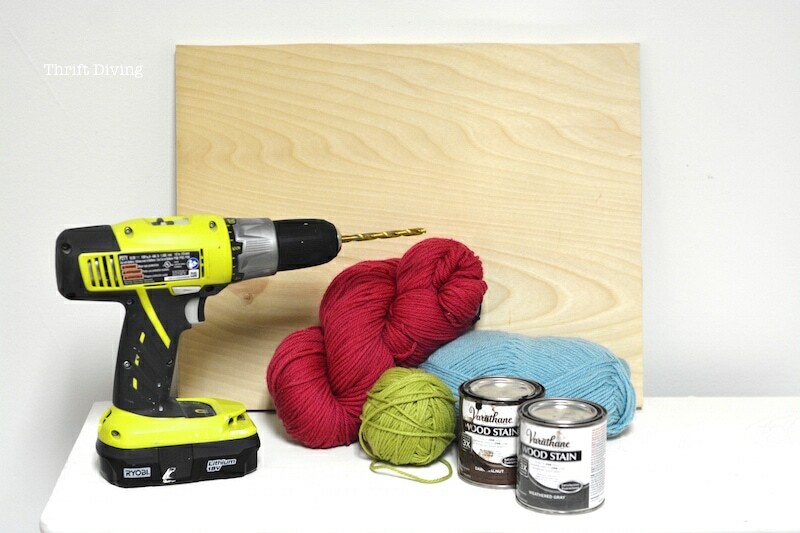 It’s amazing how just one little tool (a drill) and some wood and yarn can create a really unique piece of art for your wall! 🙂 I love it! 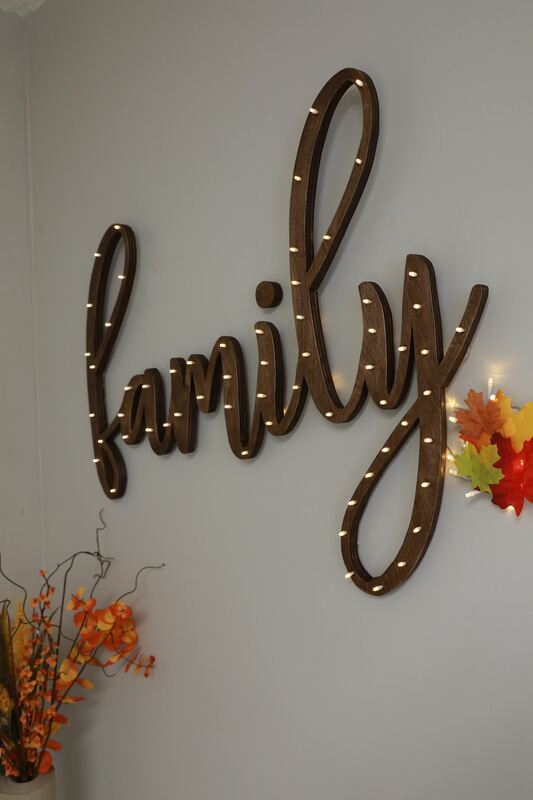 If you love doing projects with wood, be sure to check out my DIY word light wall art tutorial! 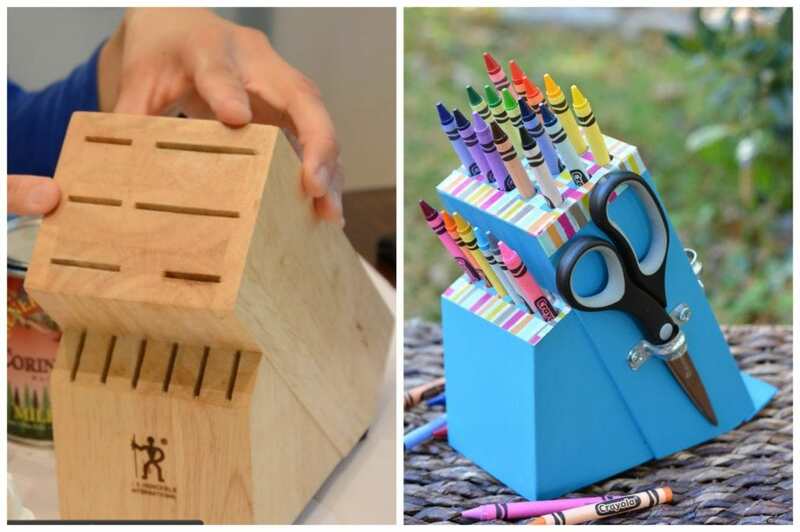 Also, if you’re looking for another easy project to do with just a power drill, here’s a fun project that is super simple: upcycling an old knife block, to hold crayons, crochet hooks, makeup brushes, and more! How fun is this?! 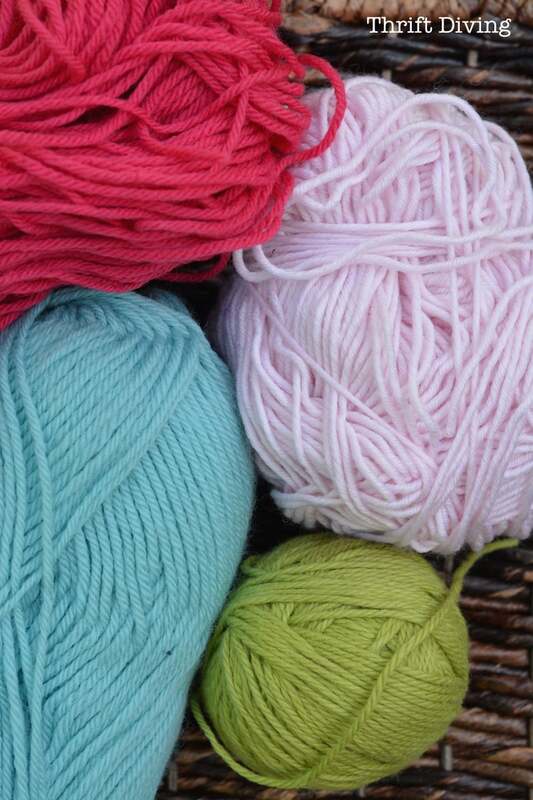 I love to crochet and knitting is something I used to do, but have forgotten since I was a kid. It’s on my must-do list. I love this project! Great job, Serena! I’ve actually been wanting to make sewing cards for my already four year old grandson. Four last Friday!! Wouldn’t it be fun to use thin wood, sand and paint the shapes and he could sew around them with yarn!? Or use yarn and using predrilled holes and his mame as his guide sew his name? Find a page from a big book and he could see around a big bear or whatever animal I modge podge onto the wood? Thank you for the inspirahktion!!! Yes, Gwen!!! I wasn’t even thinking how cool this could be for little kids to spell their name! Imagine grandkids going to Grandma’s house and getting to make cute knitted art! Ok, you’ve inspired me to do this with the kids! :). 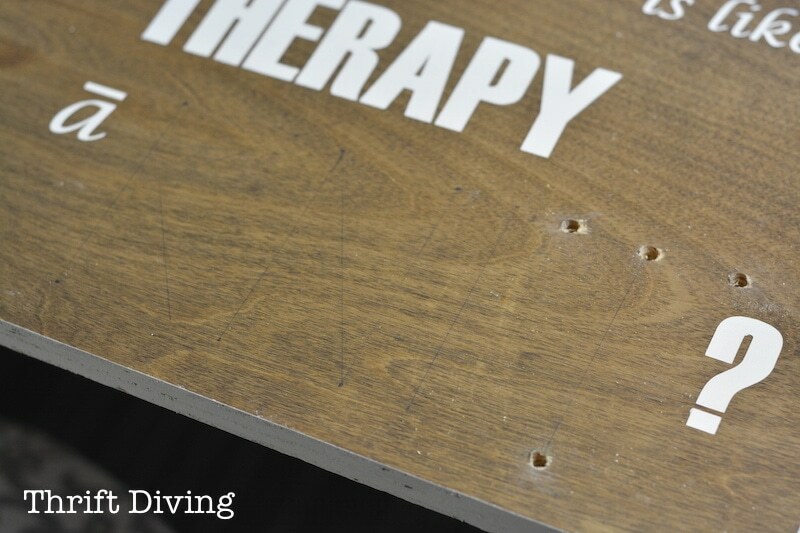 Just an FYI, you can you pegboard, too, but if you don’t want the whole thing being holes, just drill your own holes. Yay!! Thanks, Christy!! 🙂 Yeah, it was a grea challenge! Got me think in’ for sure!